This was the first Capital of Sikkim. Literally means the “meeting of three great lamas” who came from Tibet and established the Nyingmapa order of Tibetan Buddhism here. The evidence of the consecration ceremony is still intact at Norbugang Chorten in the form of stone seats and a footprint of the Head Lma on a stone. They also consecrated the first ruler of Sikkim here. It is also the entry point of the Khangchendzonga National course organised by the Himalayan Mountaineering Institute, which also has its base camp at Chauriganj near Dzongri. 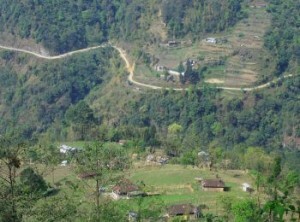 All weather roads serve Yuksam from Pemayangtse, which is at a distance of 32 kms. From Yuksam, the trek to Dzongri and to the base camp of the famous Mt. Khangchendzonga begins. Several categories of accommodations are available in Yuksam for those desiring to spend a few days there. Dubdi Monastery: The Monastery is located on a hilltop above Yuksam surrounded by verdant forest. It can be approached by trekking only, negotiating steep slope for something like 32 to 35 minutes. It is an ideal place for lamas seeking meditation retched backdrop of the sacred Mt. Khangchendzonga. This entry was posted in Sikkim, Yuksam and tagged City, Monastery. Bookmark the permalink.